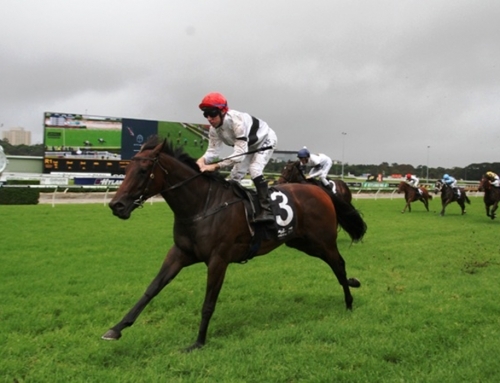 Vinery sire Testa Rossa continued his special connection with the Magic Millions when Testashadow landed a longshot victory in the $1 million Woodford Reserve Magic Millions Cup (1400m) on Saturday. Testashadow ($31) defeated fellow outsider Perfect Dare ($51) in a blanket finish on the Gold Coast. Testashadow (6g Testa Rossa – Moonlight Shadow by Flying Spur) increased his earning to $1.20 million after changing hands for $50,000 at the 2013 Gold Coast Magic Millions. He is trained by Gary Portelli for Elite Thoroughbreds and is closely related to G1 Coolmore Stud Stakes winner Zoustar. The Magic Millions Cup improved his record to 7 wins in 29 starts and he was also runner-up to Deiheros in the 2015 Magic Millions Guineas. Testa Rossa launched his Group 1 winning career with a four-length victory in the 1999 Magic Millions Classic. He sired class colt Unencumbered to win the 2014 Classic and he’s also the damsire of 2015 Classic winner Le Chef. Testa Rossa had 4 yearlings average $100,000 during Days 1, 2 & 3 at the Magic Millions yearling sale this week and there are another 3 on offer on Sunday.